When most people hear the term jujutsu, they think of an empty handed method of self-defense whereby a tiny defender neatly dispatches much larger opponents, both unarmed and armed, with a series of deftly timed throwing techniques and chops to the body. While this picture is reminiscent of the Old Joe Jitsu cartoon character, it is a less than accurate portrayal of the arts this term represents. In reality jujutsu doesn't really describe a single combat method or specific art. Instead it is a general term referring to many Japanese systems of combat that have developed over the course history. Jujustu systems also often included a variety of small weapons, such as a short knife, applied against unarmed or armed attackers. Jujutsu's arsenal, depending on the method and style, included a wide variety of arm manipulations and joint locks, striking, kicking, kneeing, throwing, tripping, and incapacitation techniques. Eventually more than 750 schools of jujutsu were officially documented in Japan each usually stressed several of these specialties. In China and elsewhere parallel systems also developed and were incorporated into many fighting systems. Today the best known term for these is Chin na (art of seizing, joint manipulation and striking). Throughout Asia and elsewhere the roots of these type of techniques are as old as man's need for self-defense. In Japan, however, jujutsu has evolved through several distinct stages . During the long periods of Japanese internal warfare up until around 1600, jujutsu techniques were most often used as a useful adjunct to weapons systems, such as the sword. Later, after 1600, many jujutsu systems (under many names) developed separately to address the needs of empty hand self-defense. These systems were separate from the techniques still practiced as part of the military arts. In the late 1800's and early 20th Century, derivatives of earlier systems emerged, such as judo, aikido, and Brazilian jujutsu --- whose primary focus was spiritual, ethical and personal development in addition to self-defense. Some of these have, in more modern times, evolved into competition (sports) forms. With all this diversity, number and types of jujutsu of systems that existed or still exist, it helpful to understand their classification under the term jujitsu by looking at the term itself. The Japanese have a method of writing known as Kanji. Kanji are characters (visual images if you prefer) and as such cannot be learned by merely hearing their pronunciation. They can often be pronounced in several ways depending on the context. Each has it own meaning and subtle shades of meaning and thus represents far more than simply sounds, as are found with letters of the alphabet. By combining the character pronounced "JU" (which means flexible, pliable, gentle, yielding) with the character pronounced "JUTSU" (which means technique, or art), we arrive with the word. 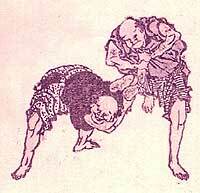 We therefore begin to see jujutsu as meaning "flexible technique", "gentle art," or "yielding technique," amongst others. This is a "primary principle" found in a large number of Japanese martial systems which differ significantly not only in technique but appearance. But certainly it is not the only principle of these arts. "The way of gaining victory over an opponent is not confined to gaining victory by giving way, sometimes an opponent takes hold of one's wrist, how can someone possibly release himself without using SOME strength against his opponents? The same thing can be asked when one is seized around the shoulders from behind by an assailant. These are forms of direct attack."